Fashion trends tend to borrow from past decades for design inspiration. The 1990s catwalks showcased bold looks that defined the decade and still look stylish today. 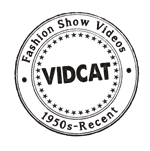 Watch this exclusive video from the Vidcat Fashion Video Archive to see all the looks!